Another year is gone….tomorrow will be the 1st day of 2012! You can read more about our trip to Texas here. I started working part-time at camp. You can read about it here. I went on a mission trip with your church. You can read it about it here. Paul and I went to Iowa to visit my college roommate, Sue. You can see more pictures from that trip here. 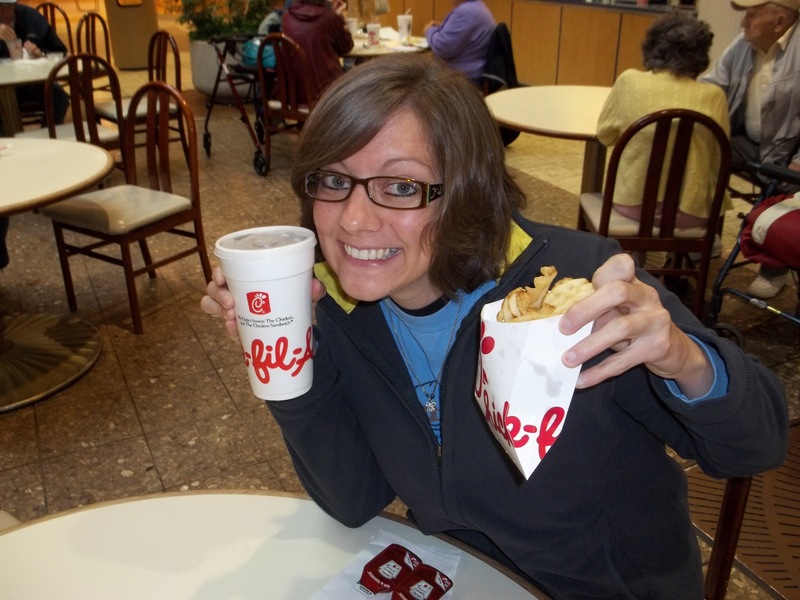 Pretty soon we won’t have to drive to another state just to get Chick-Fil-A! 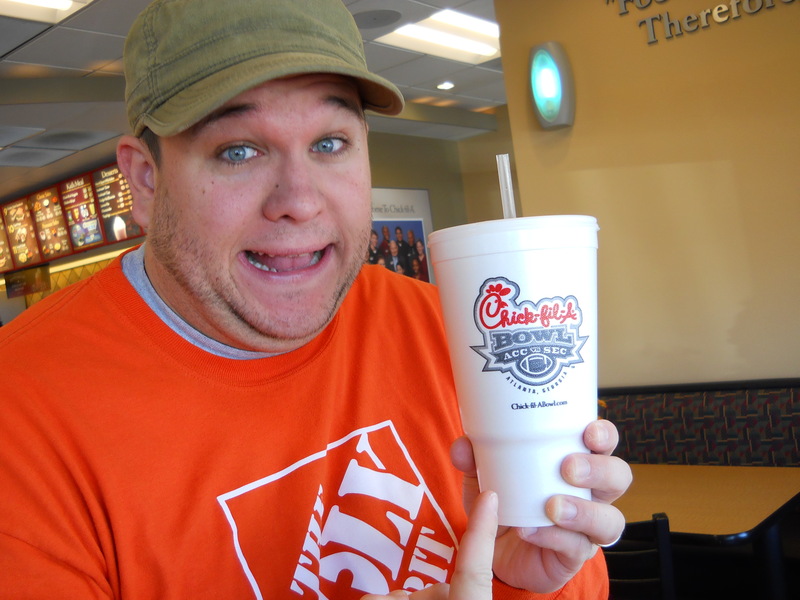 Peoria is getting Chick-Fil-A in the spring! We had our Great Oaks Banquet. 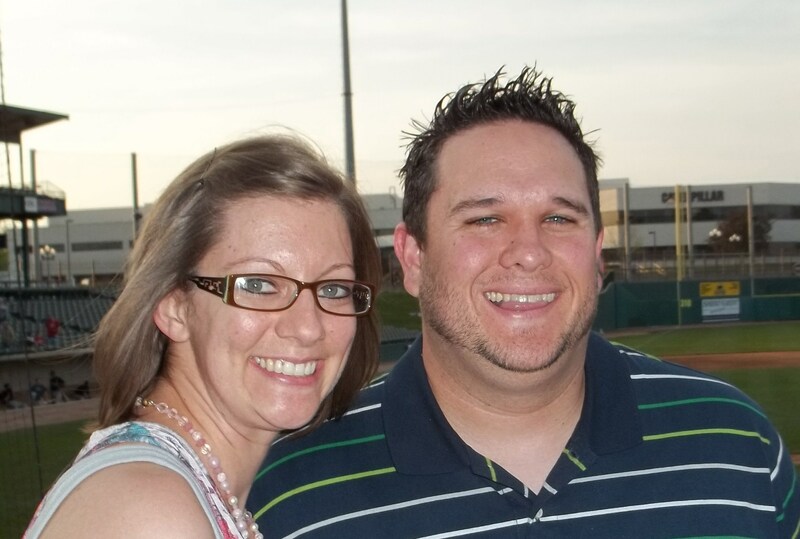 Paul and I celebrated 5 years of marriage by going to a baseball game (our tradition every year). 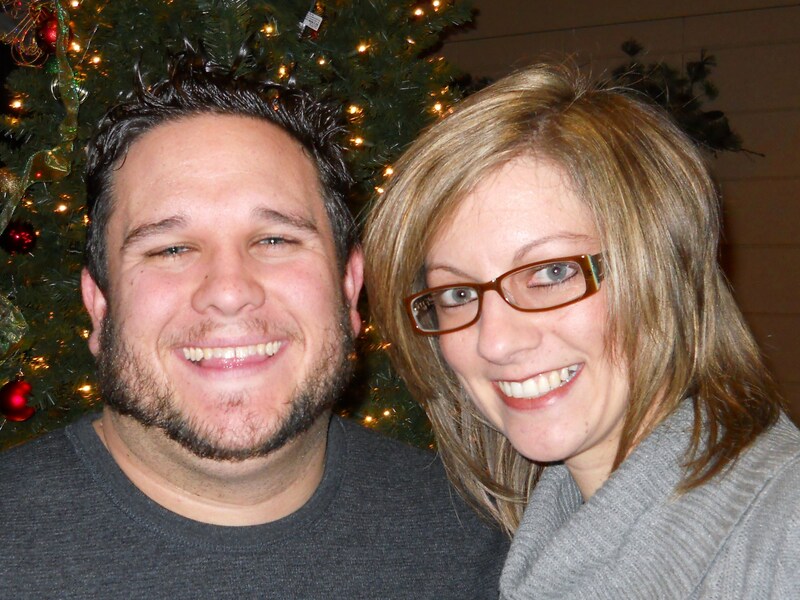 You can see our past anniversary pictures here. 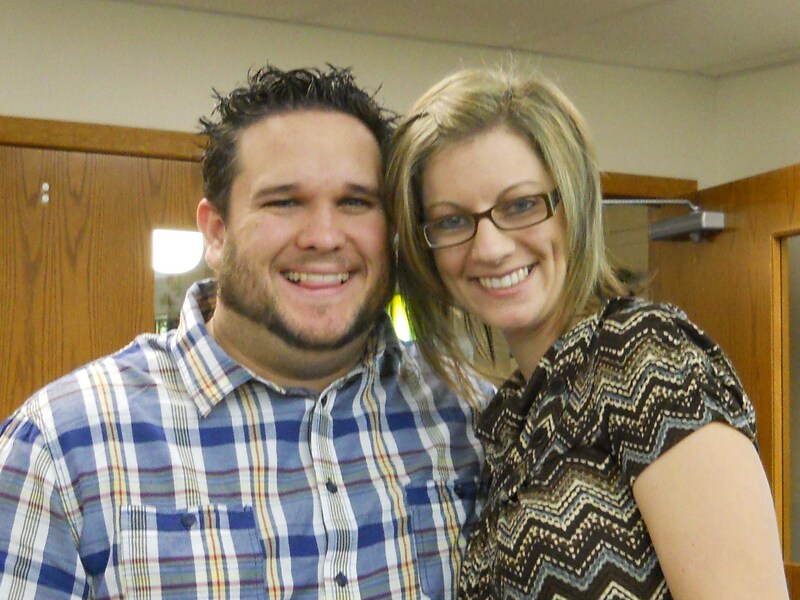 I stopped watching B (Jen decided to stay home with him) and started working at our church as a part-time secretary. I love it!! You can read more about that Texas trip here and here. I continued in Weight Watchers and hit my 10% goal! Paul and I took another trip to Iowa (we average a trip there about every other month). 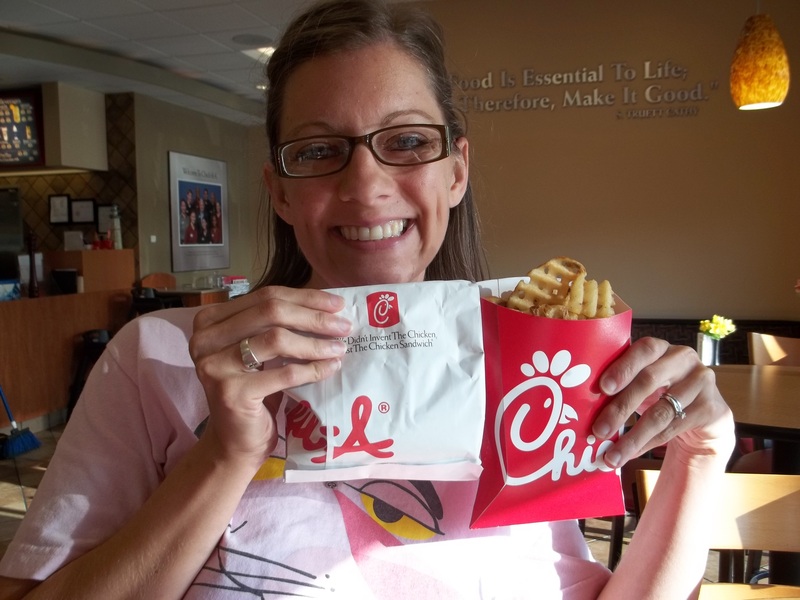 What’s a trip to Iowa with Chick-Fil-A! My “Meme” passed away on August 6th, so I made a trip back to Texas. I ran in my first EVER 5K! Unknown to me until two weeks later, I stress fractured my right heel bone! 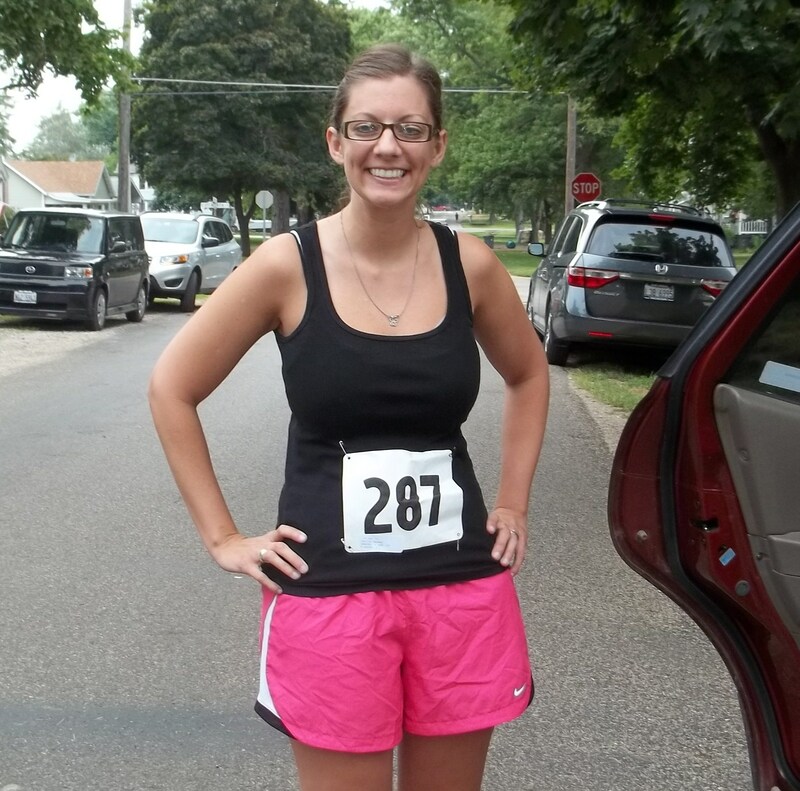 I ran the Old Settler’s 5K anyway! 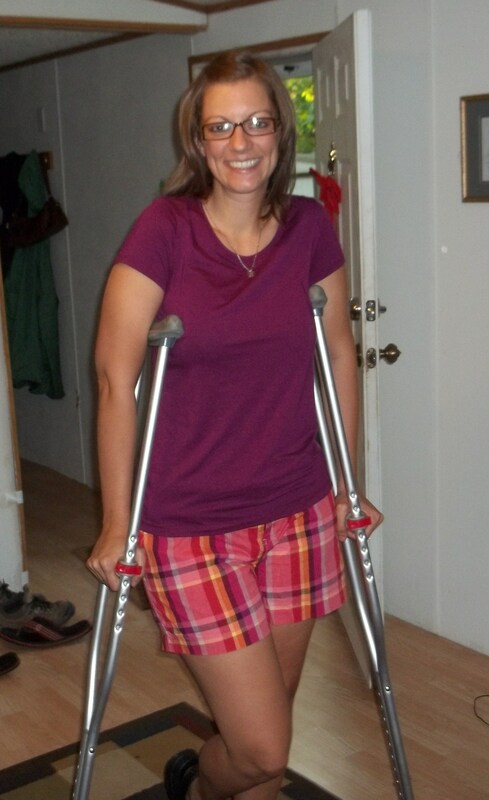 After the 5K, I was on crutches for two weeks! 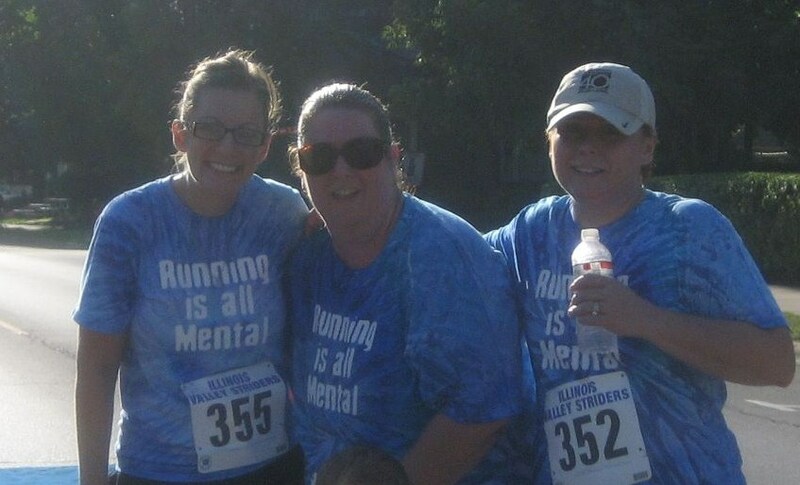 I tried to do another 5K at the end of September and failed…miserably! I am not invincible. We spent a lot of time on the ropes course at camp….practically every Saturday, sometimes Sunday, and about twice a week during the week! My mom came to visit for a few days! She rode the train from Waco to Bloomington, IL. 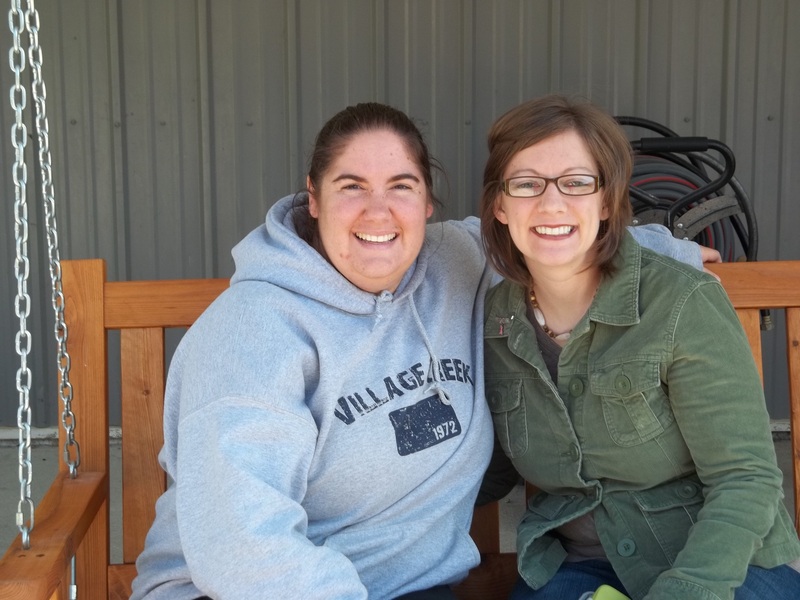 We had a great time doing lots of “girl stuff” : shopping, massages, eating out, cooking, etc. 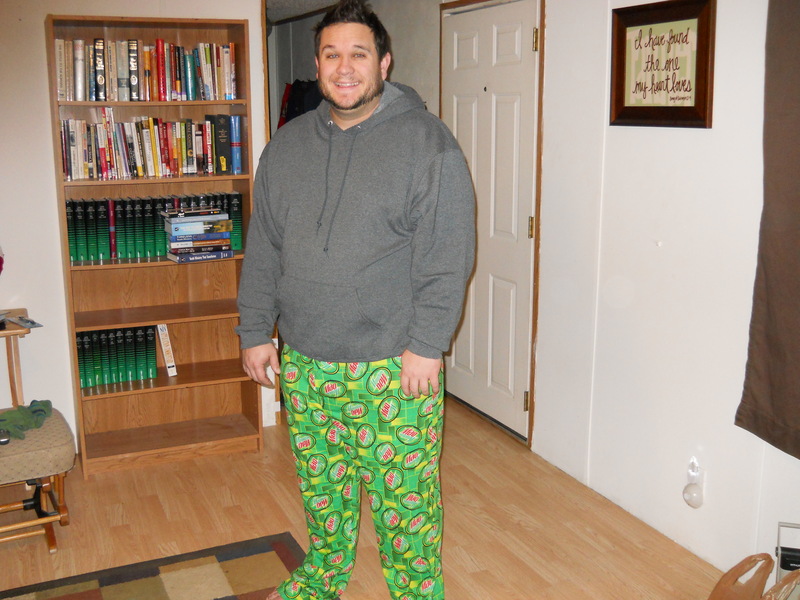 At that time I had lost 23.8; now I’ve lost about 26 pounds total! We spent Thanksgiving with some friends from church, The Terry’s. It was a very nice day. Today is the last day of December. Do you know how many snow days we’ve had?!! ONE!!!! That’s all…. 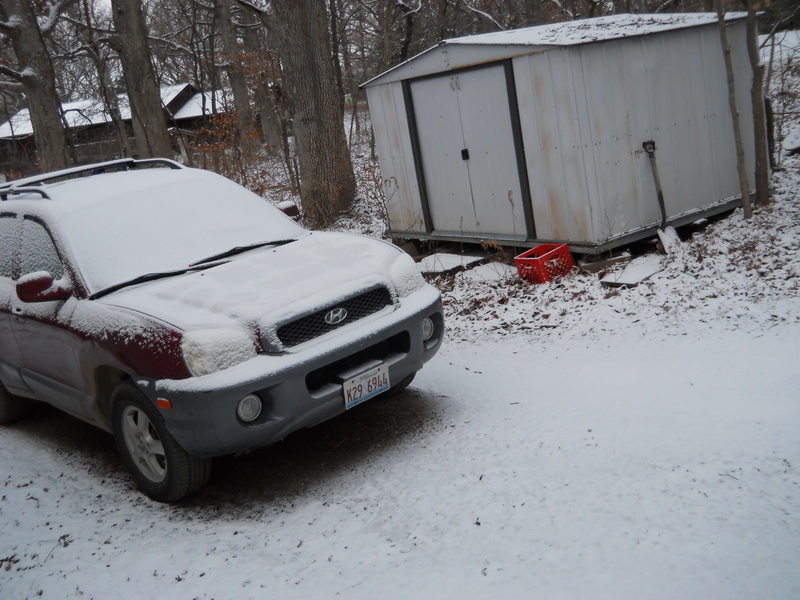 And all it was was a dusting!! Illinois, I am SUPER DISAPPOINTED! Paul went to Texas for about 10 days to visit his family. I didn’t have enough vacation days, so I didn’t go with him. Baylor Football was 10-3, beating Kansas, Oklahoma, Texas, and Texas Tech! Robert Griffin III won the Heisman! Baylor Football also won the Alamo Bowl against Washington! Baylor Men’s Basketball is undefeated so far this season, as is Baylor Women’s Basketball! It’s a good year to be a Bear!! All of our Christmas decorations are put up (in storage boxes). Now the boxes sit in our living room, waiting to be put outside in the storage shed. (Paul will have to do it, though, b/c I can’t lift them)–I’m not going to hold my breath that they will be put outside anytime soon. Our dumpster at camp is SO FULL, nothing else can be put in there. The waste management people haven’t come to empty it in a couple of weeks. We called today. They said they did come, but it was too heavy and they couldn’t lift it (they said the chain broke when they tried to lift it). (Were they going to call and tell us that or just make us wait….would they have told us, if we didn’t call?). Anyway…now Paul and Mark have to “empty” the dumpster tomorrow, enough to get the weight down. So, now we’ll have a truckload of trash sitting around camp for a week. Lovely…. Saturday is going to be “purge” day at our house. Goodwill and Helping Hands Resale, be prepared! 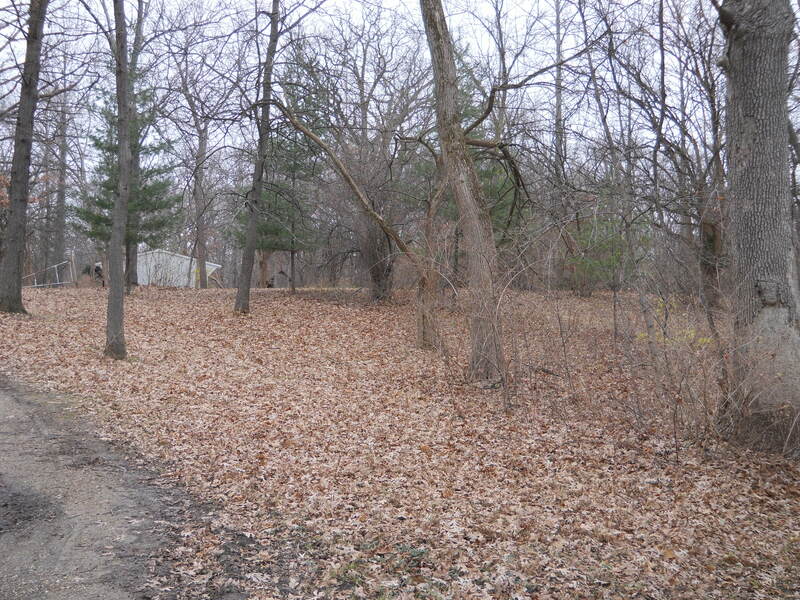 (But, of course, we can’t have too much trash, b/c of the aforementioned dumpster)…. Well, Baylor just scored again. Two minutes left. They are up 67-56….I think they’ll win!! I’m off—gotta stay awake to listen to the end! 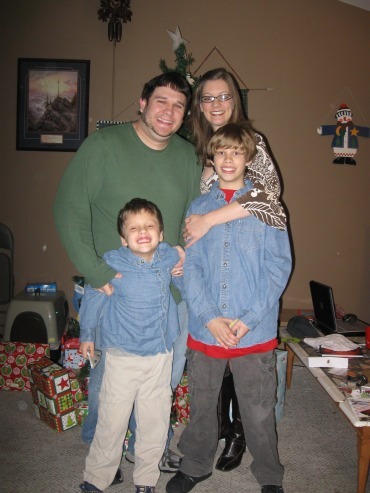 We moved here in February of 2009, right after our last Christmas in Texas…. For Christmas of 2009 we went to Michigan to be with my sister, Leslie, and her family. 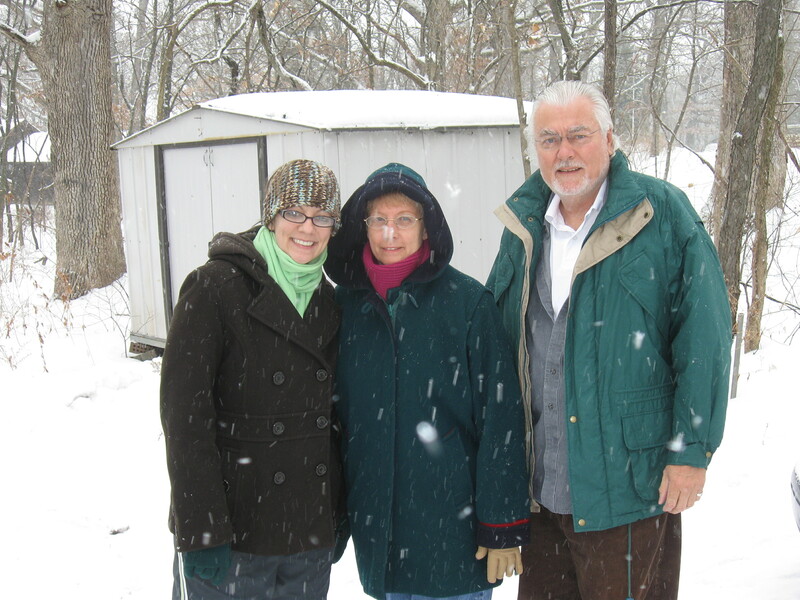 For Christmas of 2010, my parents drove up to Illinois and spent Christmas with us. But, for this Christmas, we are on our own. 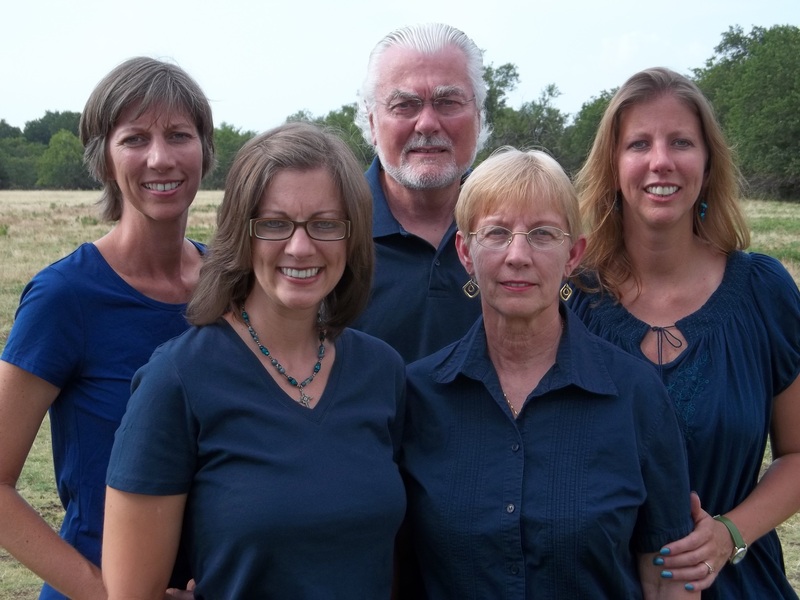 My sister, Leslie, wrote about their Christmas here. I have to agree with her. I miss family, too. I had a complete meltdown last night, missing my mom. It’s strange. I’m not sure I like being an adult: growing up, being away from family. In the year’s past I always thought (to myself), “Why can’t people be with their families on Christmas? I don’t understand why it’s so hard…why can’t they just travel at Christmas? Who would want to be alone?” And, now I am that person. (Or we are, I should say). Paul asked me last night why we didn’t go to Texas for Christmas (I guess we could’ve if we would’ve planned ahead). I told him that I thought I didn’t need it (because I had gone to Texas three times already this year and I didn’t need to go to again). But, maybe I did. However, it’s now 2:00 on Christmas Day and it’s a little late to go now. (I have to be at work at 8:00 in the morning). So, instead, Paul and I were here, just our own little family of two. We did have a nice Christmas celebration and will continue a little bit more tonight when we go to a friend’s house for dinner. Last night we went to our Christmas Eve service at church. I sang a solo (What Child is This?) and Paul ran the audio/visual. We came home from church and watched Netflix together, trying to stay up until 11:00 to go let the dog out next door. Yep, you read right. We have inherited a dog and a cat for the weekend. And, then we came home and went to bed. Because we are pet sitting, I had to get up at 6:45AM this morning and let the dog out (that’s another reason why Paul and I don’t have kids–6:45AM in the MORNING–I don’t get up that early, and even if I do, I don’t walk a dog at 6:45AM)! Anyway, so I was up and back home by 7:15AM this morning. I woke up Paul when I came home (just by crawling back into bed with my cold feet). 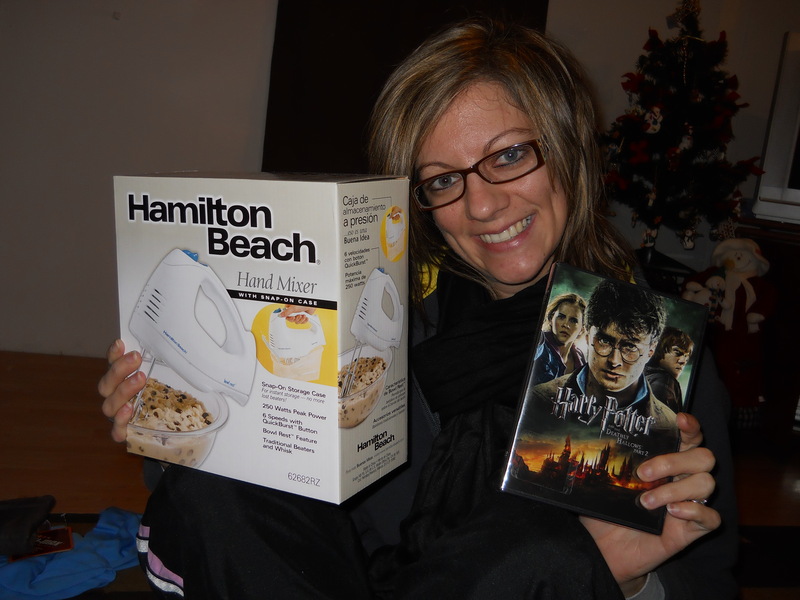 So, since we were both awake we went ahead and opened presents. When Paul went to Texas a couple of weeks ago he met my mom and dad for lunch one day and exchanged presents (so she wouldn’t have to mail our presents). Paul and I don’t exchange present with each other, so everything we were opening were from my parents and both of my sisters. We were blessed with a bunch of new, fun things! 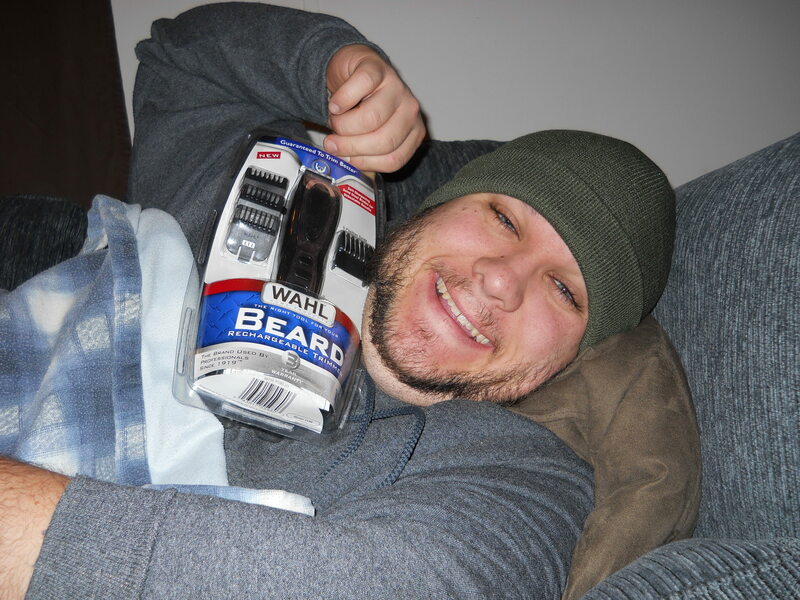 Since we opened gifts so early, we went back to bed! Our church only had one service today, so we didn’t have to be at church until 9:30 (as opposed to our normal 7:45)! We went to church this morning and then came home and had leftover stew (from Friday) for lunch. We are now at home, waiting to go to a friend’s house for dinner. Paul is out walking the dog and I’m watching Miracle on 34th street! We hope you had a blessed Christmas celebration today, regardless of where you are or who you are with! 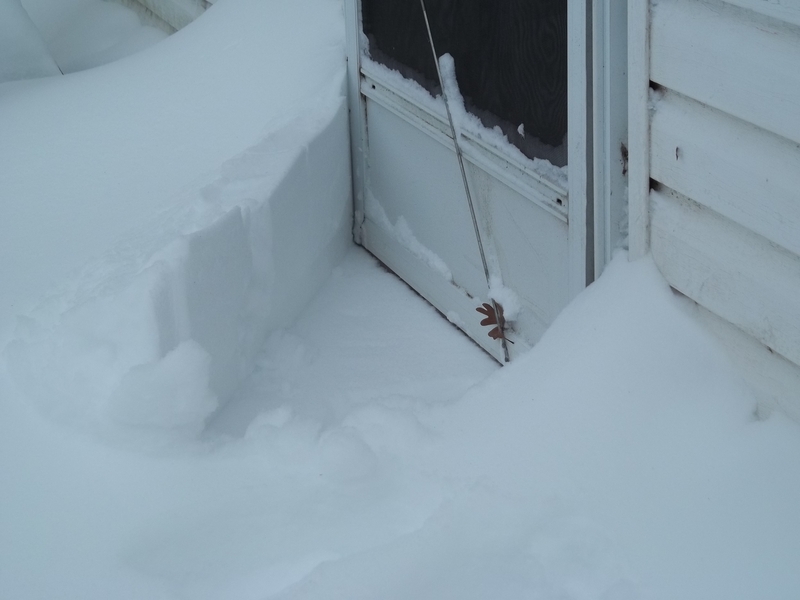 Last year at Christmas we had about 8-12 inches of snow….it snowed ALL day on Christmas Eve and most of Christmas Day! 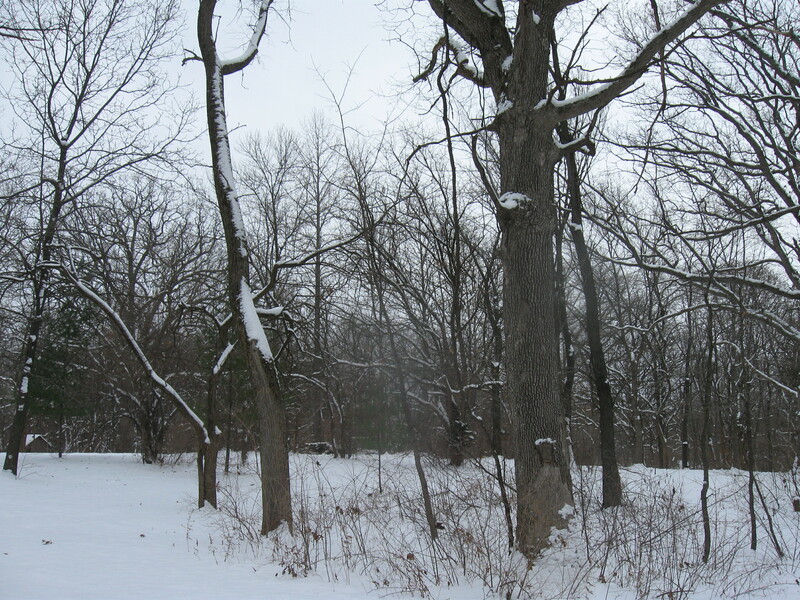 Absolutely NO SNOW! 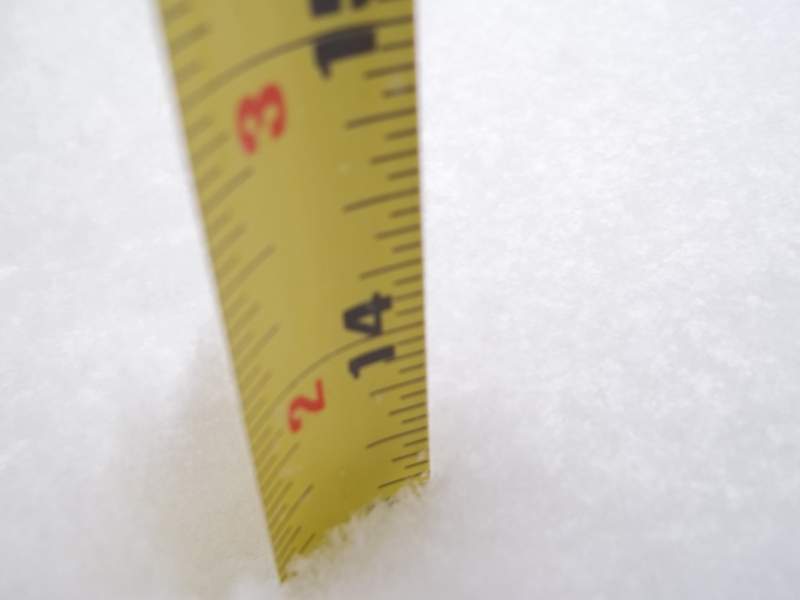 We’ve only had ONE day of snow this whole winter….and it didn’t even stay on the ground for more than a day! Very depressing!!! I know I grew up in Texas, which means we rarely had snow at Christmas, but now that I’ve had it for the past two years (since living here), I totally miss it! Here’s hoping it snows soon!! Isn’t that the question that everyone asks these days…. Are you ready for Christmas? (I heard that twice while I was at Subway the other day, in a matter of about 10 minutes)…. What does that even mean? Are you ready for Christmas? Of course, commercially, I know exactly what it means. It’s code for have you gotten all your shopping/baking/cleaning done yet for Christmas? Isn’t it sad that we’ve narrowed down the whole meaning of Christmas into one phrase: Are you ready for Christmas? I have no problem with the fact that the responses were: “thoughtful, heartwarming, engaging–cheerful.” I do have a problem that they (the writers of CNN, I suppose) believe that that is perfectly in tune with the HOLIDAY season.” (Shouldn’t that be how we act ALL SEASONS LONG, not just HOLIDAY SEASONS)!? (Sorry, got on a soapbox there for a minute). One young man from New York said, “The entire holiday season has been commercialized. There is very little religious value left for atheists to disagree with.” (emphasis mine). At first, I was stunned when I read that. I read it two or three times just to make sure I was reading it correctly. And, then, I had to nod my head in agreement. He is right. He also went on to say that most of the United States does not regard Christmas as a religious holiday, so he just “goes with the flow.” Now, I don’t know the statistics of those who believe/don’t believe or recognize Christmas as a remembrance of Christ’s birth/don’t recognize it, etc., but I do know that, if that is true, then it is sad. And we’ve failed again, as believers, to spread the Good News. (see my post from last week). One could come along and argue the fact that Jesus was probably not even born on Christmas, December 25th, so why all the hype? I would have to agree with that statement; he probably wasn’t. But, to me, it doesn’t really matter when he was born. I’m always READY for Christmas. I’m always READY to celebrate the birth of my Lord Savior, Jesus Christ, whether it’s December 25th, March 13th, October 21th, or January 6th. It’s a day of remembrance, of celebration. Without Jesus’ birth, our world would not be the same. Without Jesus’ birth MY world would not be the same. (I haven’t had the courage yet….but maybe someday. I think I’ll say it to the lady at Subway; I think she needs some Jesus lovin’ in her life). In about 24 hours Paul will be home….back from Texas after being gone for about 9 days. After renting a car, he left on Friday, the 9th, for Texas. Paul had extra vacation time (that needed to be used before March), so off he went. 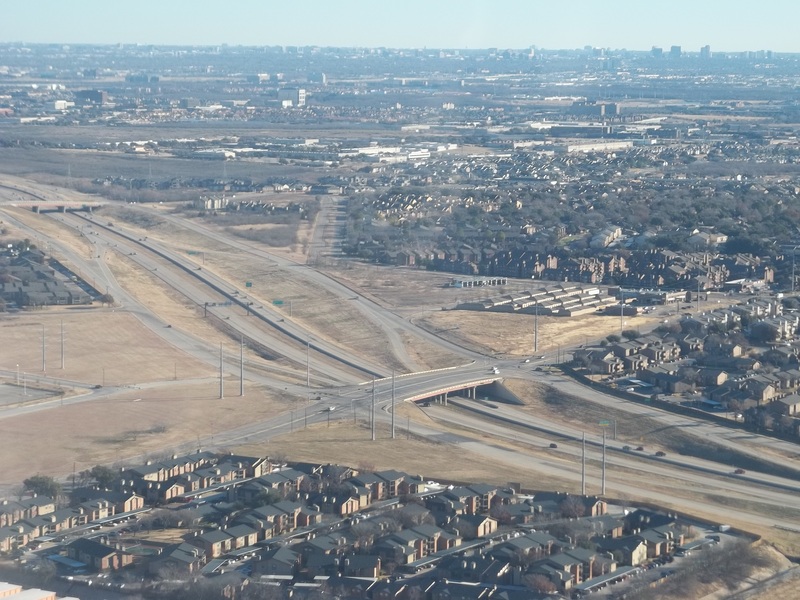 I have been to Texas three times this year (January, July, and August), but Paul has only been once (January). So, it’s been about a year since he’s seen his family…it was time. But, I do know…he missed me. He told me on Saturday, only 24 hours after he left, that he would never go on vacation by himself again (he’s been on four vacations by himself, without me). I asked him, “Why? Are you bored?” No,” he said, “I miss you!” (Isn’t he the sweetest)!! That was 7 days ago…and now he’s on his return…he left Temple today about 1:00 and should arrive in Springfield, MO about 11:0oPM tonight (his stopping point for the night). And so, my week of being single is over. It went by fast. I missed Paul, don’t get me wrong, but I just did my normal routine…going to work everyday, coming home at night. Time goes by fast. 1.) The area around the computer has been so clean all week. When Paul is home he spends most of his time sitting by the computer, so there are always water bottles, bowls, papers, cords attached to things, laying everywhere…this week–nothing. It was so nice! 2.) The floor in the back bedroom has been clean, free of clothes, all week. Paul rarely puts clothes in the clothes hamper (he just leaves them on the floor), but this week, I have been able to see the floor. 3.) I’ve only had to do laundry once b/c there hasn’t been as many clothes to wash (but Paul did inform me that he has a whole suitcase full of clothes that need to be washed–lucky me)! 4.) The bed—need I say more. I’ve spread out all week! 5.) I only took the trash out once. I guess there’s less trash when Paul’s not around (or I don’t cook as much, so there’s not as much to throw away). 1.) MICE!! They’re BAAAACCCCKKKKK! It’s mice season; I caught TWO this week while Paul was gone! 2.) Raccoons…if you remember this post, you know we’ve had a raccoon before. Well, I think he’s back. Or maybe a relative (b/c that raccoon was taken far away to Hopewell). I hear him in the evenings and at night. Jim did set a trap earlier this week, so hopefully we’ll catch something soon. 3.) The bed–I miss Paul being next to me. 4.) I don’t like having to talk to Paul on the phone. It’s hard to hear sometimes (b/c of cell phone coverage at his mom’s house and on the road), so I get frustrated when I can’t understand him. 5.) Not having anyone to yell at that it’s midnight and it’s time to go to bed! 🙂 (It’s a constant badgering between the two of us)! 6.) 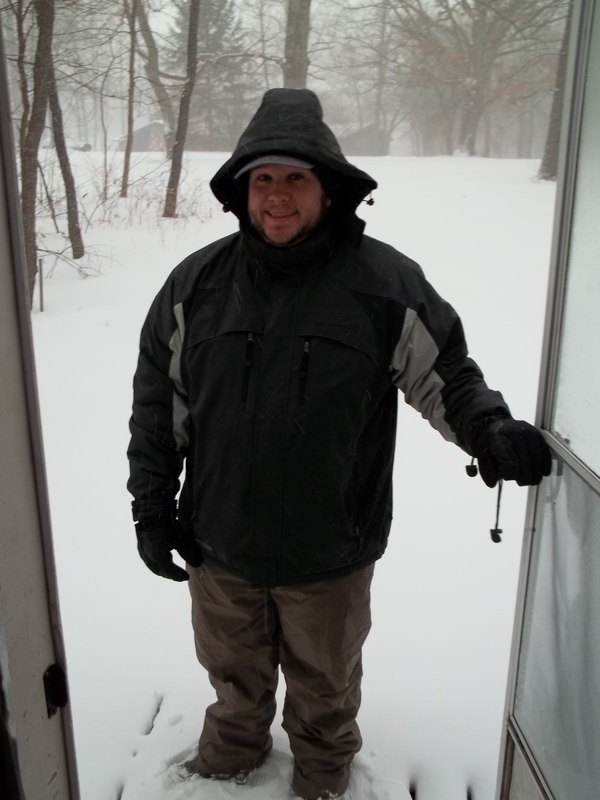 Just not having Paul around to talk to…when I come through the front door and yell, “HELLO!”–no one is here to respond. So….here’s to my Bachelorette week! Can’t wait to see Paul tomorrow! I will be honest and say I’m not very crafty….I love to look at other people’s crafts (and wish to myself that I could do what they do), but I just never really like to do my own b/c it takes too much time (and money). But, this one….I could do. It was easy and inexpensive….so I did it. So, there’s lots of variations on how you could make this, but this is just how I did it…. I made three wreaths last night and it took me about 45 minutes…not too bad! 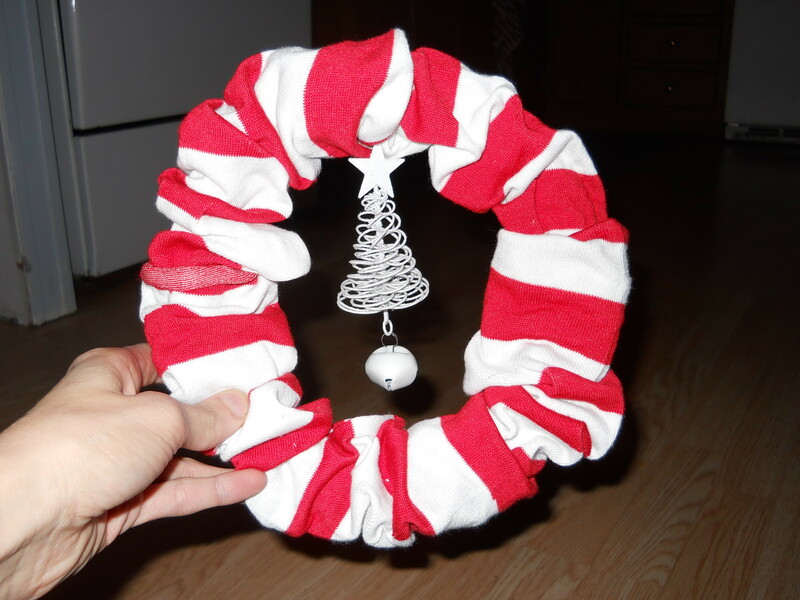 You could probably do a bigger wreath, but you would need more socks. 3.) 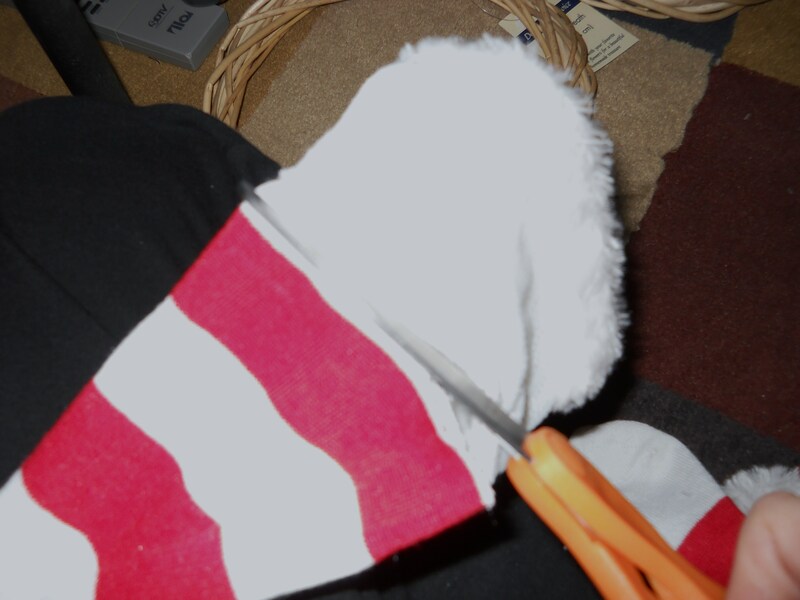 cut the “toes” off the socks and cut the “top part” of the sock off. On this particular wreath I did NOT save the top part b/c they were made of fur. For the other two wreaths (that you will see later), I did. I don’t have a picture of this part, but basically you just cut through or “break” the twine–yes, it’s a little difficult, but doesn’t take too much effort. You need to cut it completely apart b/c you are going to want to get the sock on to the wreath (it’ll make more sense in just a second). It will get messy (breaking the wreath) because all the twine shavings will get on the floor, but you can just vacuum later. 6.) duct tape the wreath back together. I don’t have a picture of this, but basically you just wrap tape around the wreath to put it back together. 7.) move the socks around to cover up the duct tape. It took me a little bit to figure out how to make the socks “stay” so you don’t see the seams or they don’t come part. I learned, if you overlap the socks on top of each other and turn the seam under (almost as if you were making a hem, but you don’t sew it) where all the sock ends meet, it will stay together. 8.) i had a Christmas ornament ($.50 cents) that I just tied to the wreath so something would hang down in the middle. But, you can also just leave it plain. So, for this project, it cost me $3.50. Then, I made two more!! 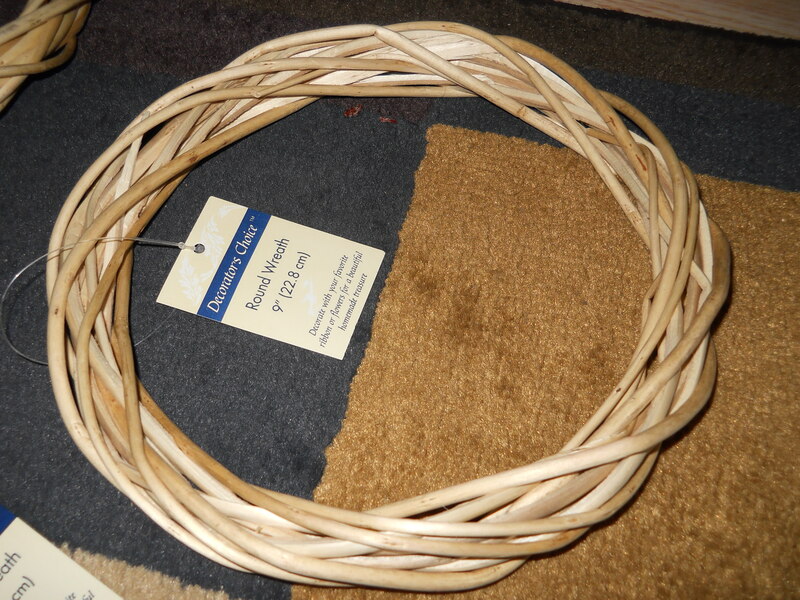 Things I learned after making Wreath #1. 1.) On the 1st wreath, I did not cut the heels off, but on the 2nd and 3rd one, I did. It made the socks into 4 pieces,instead of 2, but I didn’t like how the heel part “stuck out” and you could see the heel seam. So, I snipped it off. 3.) On Wreaths #2 and #3 I kept the top part of the sock. You’ll see why in a minute. Here’s Wreath #2 with a hanger on it. see the "hanger" in the back? It’s the top of the sock. 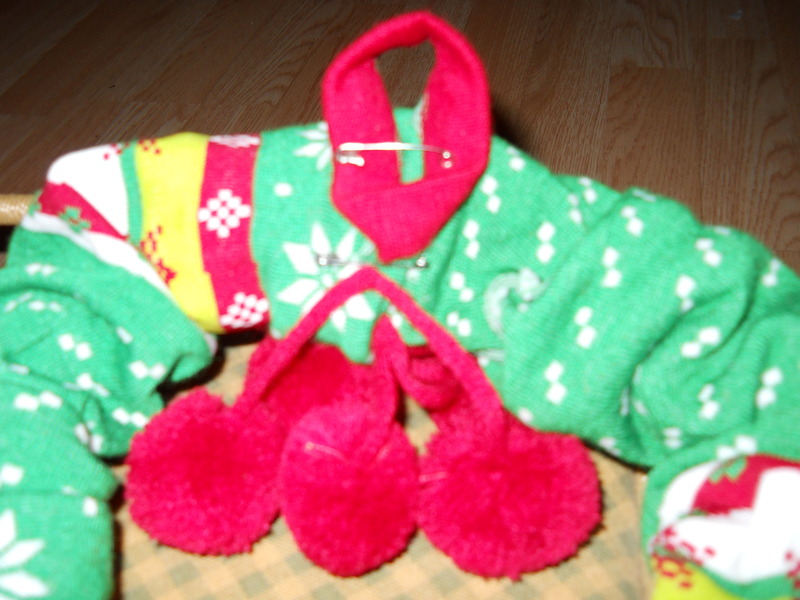 It also had the fuzzy “balls” hanging from the top of the sock, so when I kept the top of the sock, the “balls” stayed on and became the centerpiece of the wreath. 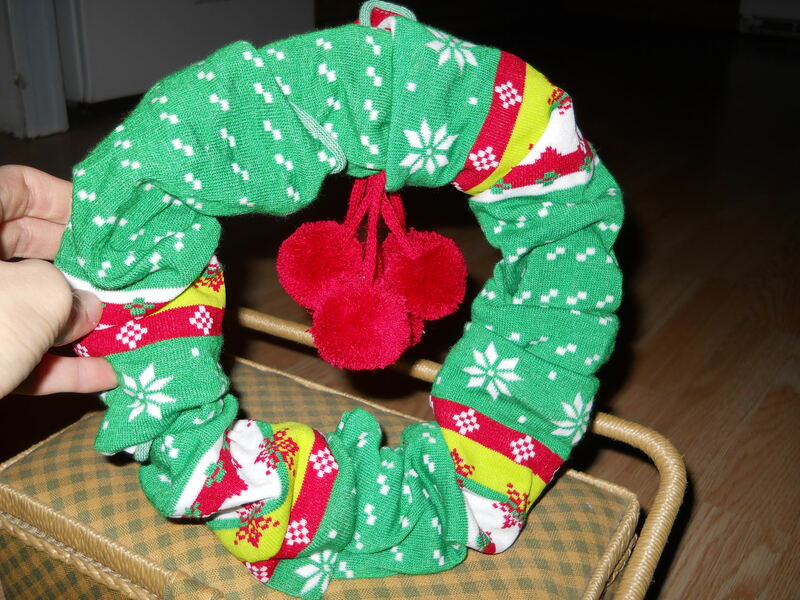 This wreath cost a little bit more because the socks came from Wal-Mart, not the Dollar Tree. 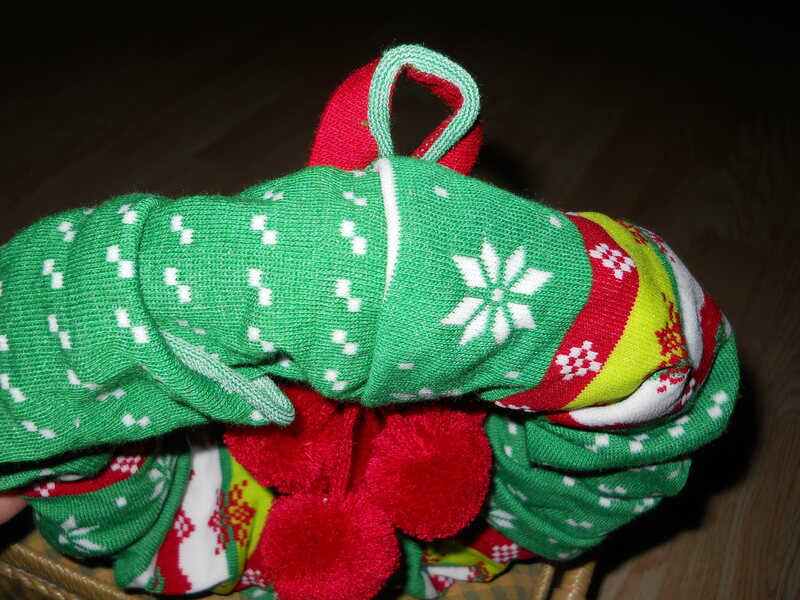 So, this wreath costs about $7.00 because the socks were $2.97 per pair (the wreath was still from Dollar Tree). 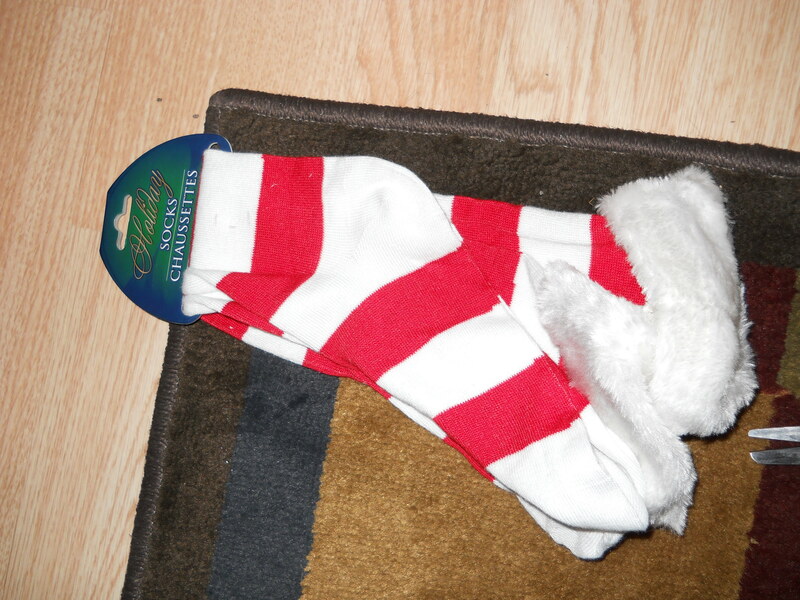 I think I need to “fluff” these socks a little bit….they are supposed to be more “scrunchie” looking. 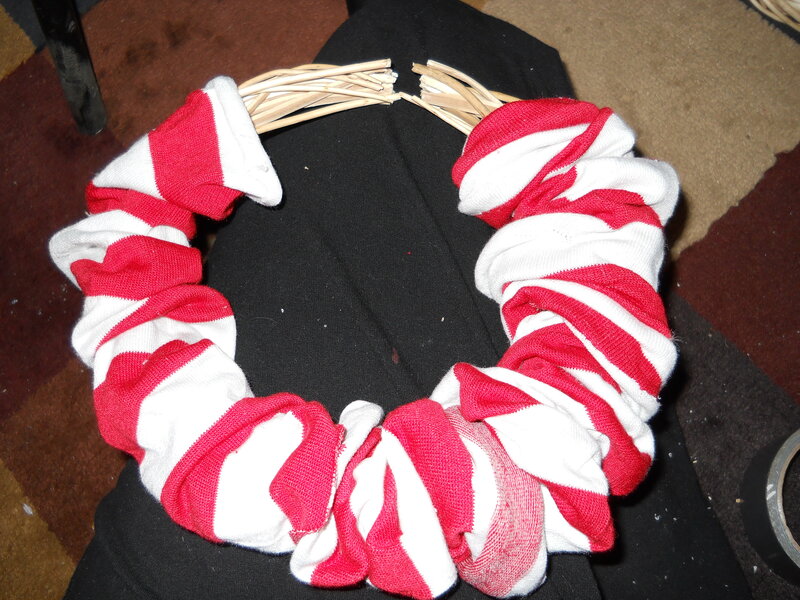 This wreath has a “hanger” on it, too; I just kept the top of the sock, like I did on Wreath #2. 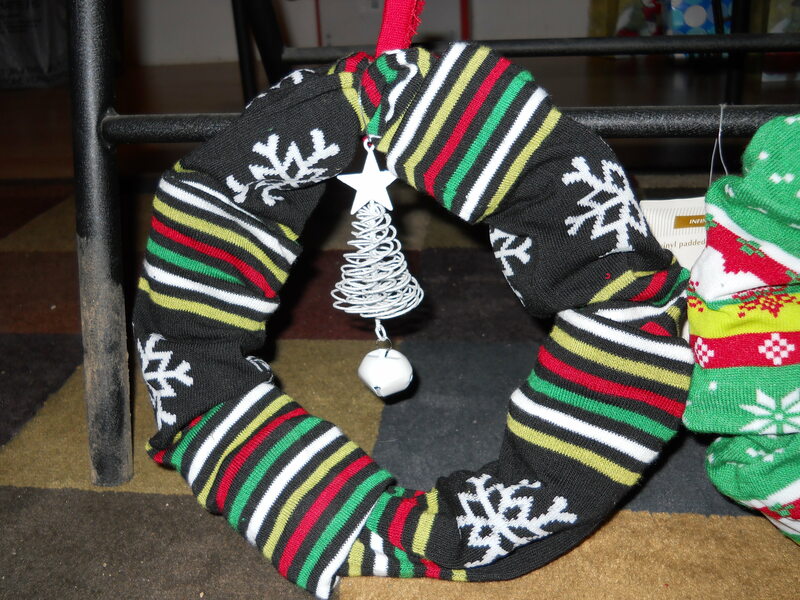 This wreath cost about $7.50 because the socks were from Wal-Mart ($2.97 a pair) and the ornament was $.50 cents (the wreath was still $1.00). So, there’s my crafty side. You won’t see it very often (because, like I said, I’m not very crafty–I love good craft ideas; I just don’t like to spend the money to make them).